Going over weather data for Tuesday and Wednesday and I am not liking what I am seeing. There is still a lot of disagreement between the models as to the exact track of the storm and the track will be everything. What the models are pretty sure of is a storm developing over western Texas by late Monday night. The storm will quickly track to the northeast. Another thing the models are all indicating is a lot of moisture for the storm to work with. This is the first southern track storm of the winter for the KFVS viewing area and it appears it is going to have an ample supply of moisture from the Gulf of Mexico. Early indications of what kind of precipitation from NOAA's Global forecast model is something that this area doesn't want to hear about. Ice. Here is a look at the what this morning's GFS model is showing for Cape Girardeau. To read the above chart, time goes from right to left. The thin red line is the surface temperature. The vertical bars indicate moisture. Green is rain. Blue is snow. Orange is sleet. 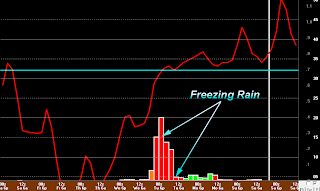 Red is freezing rain (ice). You can see that the model starts the area with a little bit of rain as the surface temperature is in the middle 30's. I have drawn a horizontal blue line in the chart to indicate where the 32 degree line is located. 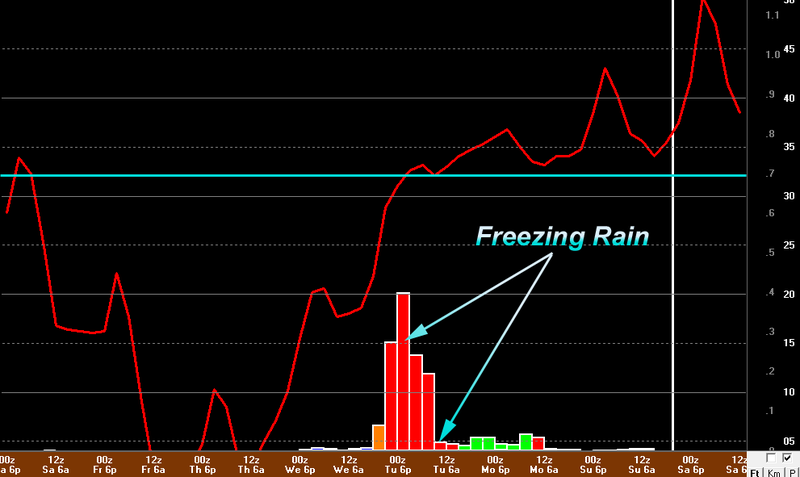 Notice that once the surface temperature drops below the 32 degree mark the precipitation changes over to freezing rain. As I mentioned above the models are keeping this system very wet. The GFS is suggesting 1.14" of rain falling as freezing rain. Just north of the area towards St. Louis the model is keeping it all snow and a lot of snow at that. It is suggesting 14"-18" of snow for St. Louis Tuesday in to Wednesday. On a side note I am still in the process of trying to get over whatever this nasty sickness thing I've had for almost a week. I am hoping to be able to go back in to work tomorrow.